What's up with this weather? Today, we here in Arkansas, specifically NE Arkansas, are under a Severe Weather Alert. We are expecting super cells with tornados embedded in them. We are all watching the sky and the radar to see what happens. Hopefully nothing, however we are all prepared. Some area schools have already let out and are taking the children home. Word is that the storms will develop from 3:00p.m. on, and the schools don't want to have busloads of students on the roads during this time. My oldest daughter picked up her son and they have headed to Mississippi where there is no severe alerts. My younger daughter and her family are heading to her in-laws where they have a storm cellar. I'm not sure what my son and his family will do. They have a safe area in their house(that's not to say a bonifide safe room), but it should keep them as safe as anything could, except being underground. Then there's me. I don't like storm cellars, and often tell the kids that I need to stay on top to tell the emergency people where to dig them out. I think my fear of being trapped and no one finding me is worse than taking chances with the storm. I'd much rather be at home, but after seeing the homes in Joplin, Mo, I'm not too sure home would be very safe. We have a computer room here that has 1 foot thick walls reinforced with re-bar, and the roof is the same. The only thing is they cut corners by putting in glass doors rather than the heavy ones they should have. Still, that's probably a safer place than my house. I just don't want to stay here until 10p.m. That's when the storm threat should be over. Hopefully the storms won't develop and I can go home and watch the ballgame. I hope you are having a great day. Love each other. I'm going to be off for a couple of days the end of the week, and I have a To-Do list. I'm thinking if I put what I need to get done in a list, I will be more likely to make it a To Done list. I'm going to start with the oldest things first, since these things have obviously been sitting there the longest. 1. I made two sundresses last year for the oldest two granddaughters. Unfortunately, they were too big, so rather than redo them, I put them back to finish this spring. Here's what they need. A. Buttons and buttonholes for the straps. B. A bit of embroidery work on the collars. C. Button and holes where the collars attach. D. A tuck near the bottom to make them just a touch shorter. All this could be done in a couple of hours. 2. I smocked a front for a dress for The Banty Hen earlier in the spring. It got laid aside while I did Easter dresses. Here's what it needs. A. Trace off the pattern and cut it out. B. Sew up the dress. Now this will take a bit longer, but should be accomplished easily in a day. It's a simple dress smocked from the shoulder not rocket science. 3. My dil's mother and step-father have one of those mobile BBQ wagons, and they asked me to make a couple of tablecloths with elastic around them for their picnic table, which I did, but with the rest of the material, they wanted one that would go over their square chest deep freezer. That requires. A. Cutting the fabric using the measurements given. B. Running it through the serger. I'm allowing 2 hours from start to finish on this one. 4. A friend whose daughter is getting married asked me to serge around the edges of a couple of pieces of fabric--note the word couple. When she brought it to me, she wants 2- 15" squares out of two pieces of satin - one green, the other peach. Then she would like as many 12" inch squares as I can get out of the rest. That's 4 15" squares, and I don't know how many 12" squares. So, here's what has to be done to those. B. Mark and cut 4 15" pieces, being careful not to waste any. C. Serge all of the pieces. This I'm allowing at least 4 hours. I believe my two days off are full. This weekend is also our family reunion. I've been asked to make potato salad, and I'm possibly going to attempt to make a watermelon cake. That's Saturday used up. At some point I have to go get the hamburger meat, hotdogs and a few other things. The reunion is Sunday afternoon. I'm hoping there are enough left overs that I won't have to cook on Monday, and with a little luck, I won't see anyone all day. I'll have pictures next week of what I finish on my To Do list, and if the cake turns out, I'll have a picture of it. I'm trying to polish up my limited decorating skills since the next weekend I'm making a My Little Pony cake for The Banty Hen. That girl lives and breathes My Little Pony. I guess this sounds like I'm complaining--I'm not really. 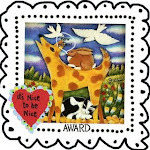 I love making things for my grandchildren, and doing for others. Besides, I get paid for the tablecloths in BBQ, and boy is it good. I'll keep you posted on how things progress. We here in the mid south(namely Arkansas) continue to have rain. Along with that rain comes thunder, lightening, sometimes hail and tornados. It stormed about every hour last night, nothing major, just enough to wake me from my needed rest. I'm not complaining mind you, I still have a roof over my head, unlike those unfortunate folks in Joplin, Mo, and other places. My heart hurts for them, especially those who lost loved ones. As I looked at the pictures on the internet of the destruction, the 1968 tornado came to my mind. It was also a troublesome year for bad weather, and a good piece of Jonesboro was stripped from it's earthly bearings. 35 lives were lost, many severly injured. I very well remember all the chaos during that time. 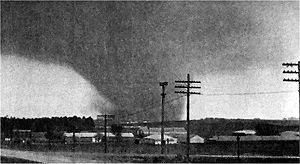 It's been 43 years since that tornado had it's way with Jonesboro, and if you drive through those areas now, you see very little to remind you of what happened that night in mid May, but it is still very vivid in the minds of those who lived through it. Please remember all those who have been affected by these storms. Hope you have a good day. Love each other. What is that song from Mr. Ed, something about a horse is a horse of course of course, and something about unless it's Mr. Ed. Well, there is another type of horse for a school program. It's a Diva Horse. Princess #1 has turned into a diva of sorts, and last night she was a horse. When I commented about not having ever seen a horse with pink finger and toe hooves, she informed me hers were pink because she was a diva horse. It's kinda hard to tell, but in the first pic here, you can see her ears and mane made of knitting yarn. The second pic is a side view and shows her tail. We are so pleased with the school that 3 of my grandchildren attend. The kids are happy going there and they are always involved in something. A couple of months ago, Princess #2, and her cousin Superhero were in a program where everyone was bugs. They allow the parents to come up with a costume(nothing elaborate) and it's such fun to see what some of them look like. P#2 was a ladybug, and Superhero was a lightening bug(firefly if you aren't from the South). P#1 was in last nights program, and it was called, 'The Cheese Stands Along', based on the song, 'The Farmer in the Dell'. There was the farmer, his wife, the nurse, the child, the dog, the cat, the rat and of course the longsuffering Cheese. Some of the children were dressed as cheese from all over the world. The cutest one was string cheese. The rest of the kids were divided up into farm hands(cowboy hats, plaid shirts, etc) and various farm animals. They all sang, some had lines, and everyone did a great joy. The director introduced the different groups and they were given the opportunity to take a bow. Having this opportunity to be in the spotlight and being praised for a job well done is such a wonderful way to build self-esteem in these young children. I was not only proud of my granddaughter, but of everyone's grandchildren on the stage. Hope the sun is smiling on your face today. Love one another. This year's flood through the Mississippi River Delta will go down in history along with the 27 and 37 overflows. The levee system is much better now than it was then. In fact, I doubt there were any levees back then. When the river overflowed, it just meandered wherever it found a low spot. I live in a small town on the banks of the Kahlua colored St. Francis River(pictured here). It's always this muddy, thus the name Kahlua colored. This picture shows how close to the top of the levee the water came. Just below the bridge in this picture, the levee had to have some reinforcement to keep it from overflowing. I have heard that if that had indeed happened, plans were in place to evacuate us. The St. Francis River has it's head waters in Missouri. We feed out of Lake Wappella. However, we do feed into the Mississippi, just quite a good ways on down the river. I live about 3 blocks from the river. This picture shows my yard, even though that isn't my house. The water came up to my house, but didn't get in. I have a crawl space, so it would have taken quite a bit of water to actually get in. Thankfully, I didn't have to find out just how much it would require. We fared so much better than so many during this trying time. I was never without basic necessities, I don't have to file insurance reports on any damage(other than we considered asking for government assistance for the garden). It looked pretty sad for a while, and we lost a few things, but not so much that we'll go hungry this winter. I was able to get to work each day with only minimal worry about what I might find when I got home. Fortunately, one of my neighbor/friends called and gave me updates from time to time so I wouldn't worry. All in all I really wasn't inconvenienced in any way by the flood. Unfortunately, there are so many who have been inundated and still have water/mud in their homes and have lost so much. Many have already started rebuilding already, especially along the Black River. I doubt I'll ever see this type of flood again in my lifetime. This is a part of history. Someday our children and grandchildren will watch footage and see pictures on some weather documentary, just as we see pictures of the floods back in 27 and 37. I'm sure they will look just a foreign to our offspring as those pictures do to us. Hopefully, we won't have to deal with it again. Hope you are having a good day. Love each other. Hello everyone. It's been quite a while since I posted. Don't know why. Just one of those things. However, I want to tell you about my youngest granddaughter's T-Ball game. I went last night to watch her 'play'. She was fine when it was her turn to hit the ball and run the bases. However, her attention span gets very short when it's time to stand out in the infield waiting on a ball to be hit in your direction. Most of the time, she wandered around. There was an older gentleman(I'm assuming he was there to help), out on the field near 1st base. She would go over and stand up against him like he was her best friend and talk to him. Her mother said they had never seen him before. She doesn't usually take up with strangers. But then one time while she was on 3rd base, she was showing the coach her belly. They are all cute. She's almost 4, and I really think some were younger. It was fun watching all of them with caps a little bit too big, trying to keep their gloves on their little hands, and running. They were so adorable. My next to the oldest grandson turned 14 on the 16th of this month. My how times flies whether you are having fun or not. We bowled, ate pizza and had cake and ice cream. He got Chicago Cubs baseball tickets for his birthday. He told his other granny, it was the best birthday ever. I hope this post finds everyone having a good day. Be nice to someone.